Seven Years in Tibet (first performance, fragment, 1996). Seven Years in Tibet (single edit). Seven Years in Tibet (Mandarin version). Seven Years in Tibet (with Dave Grohl, 50th Birthday Concert). Seven Years in Tibet (The Rosie O’Donnell Show). 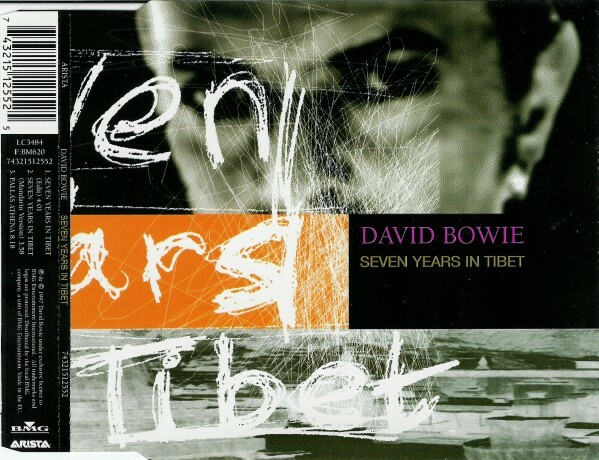 Seven Years in Tibet (acoustic, radio broadcast, 1997). So much of what first appealed to me about Buddhism has stayed with me. The idea of transience, and that there is nothing to hold onto pragmatically, that we do at some point or another have to let go of that which we consider most dear to us, because it’s a very short life. Bowie, interview, Daily Telegraph, December 1996. Heinrich Harrer, an Austrian mountaineer, had been in a British prisoner-of-war camp in India for the length of the war. While he’d escaped in 1944, he didn’t try to join the Nazi army but instead ventured into Tibet, spurred by curiosity about a country considered off limits to the West. He was acting as a remnant of old Germany, the land of mountaineers and mapmakers, of the Wandervogel, the German naturalist movement which the Nazis had plundered for members and imagery, then banned. Crossing the Himalayas by foot and yak, Harrer spent the late Forties in Tibet’s capital city, Lhasa, befriending and tutoring the young Dalai Lama, designing structural improvements for the city and chronicling in journals and photographs life in the last years of independent Tibet. He fled just before the Chinese came in 1950. At the time, Harrer offered the prospect of a “clean” German/Austrian, a man who had the moral stature to depict Communist abuses. As is often the case, he wasn’t that clean. After Austria had been absorbed by Nazi Germany, Harrer had joined the SS in 1938 and had asked Himmler permission to marry, certifying that he and his fiancee were pure Aryans. So Tibet wasn’t just an appealing curiosity for him—it was one of the few countries bordering India that Harrer could have gone to in 1945 without facing the implications of his past. From most accounts, Harrer seemed primarily guilty of ambition in his youth: there is no evidence of him committing atrocities. Joining the Nazis was a good career move for him in the Thirties, much as how obscuring his Nazi past was a great career move in the Fifties. His memoir, Seven Years In Tibet, was published in 1953 and was an international bestseller. Regarded as a paean for a lost country crushed by the Communists, Tibet is more hard-headed than its reputation suggests. Harrer balanced the beauty of the Tibetan landscape and of its culture with the sordid reality he found: filthy bodies, filthy streets, high rates of venereal disease, appalling levels of child mortality, and a cultural passivity mixed with occasional spates of chaos, like palace coups and monk rebellions. The Chinese, when they conquered Tibet, claimed to be modernizers. They abolished serfdom, paved roads, brought sanitation and political order, and suffocated an ancient culture in the process. Tibet became, among many things, a parable of modernity: life made easier and cleaner at the cost of the inconvenient past. Old Tibet was a culture the modern world had no more time for. In Tibet, one is not hunted from morning till night by the calls of ‘civilization.’ Here one has time to occupy oneself with religion and to call one’s soul one’s own. Here it is religion which takes up most room in the life of the individual as it did in olden days in the west. 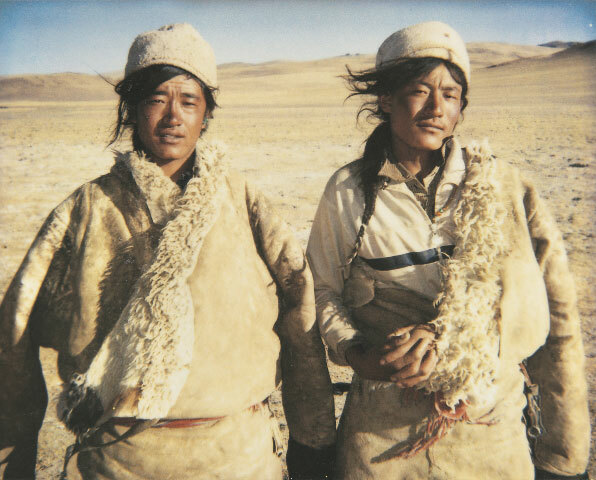 Harrer, Seven Years in Tibet. Though Harrer was quick to describe the Tibetans’ shortcomings, his enchantment with the life he found in Lhasa permeates his writing, and he closed his book sounding like a man exiled from a dream. I managed to cope with most things when I worked with David—except the Buddha. Kenneth Pitt, Bowie’s manager in the late Sixties. For a young, irreligious British suburbanite in 1966, Harrer’s Tibet wasn’t any heaven on earth or a mystic theme park, as some weekend Buddhists considered Tibet to be. It was a culture where spirituality, and maintaining the health of the soul, was far more important than making money, than acquiring fame and attending to family. So Buddhism took root in Bowie. Though some of his colleagues and friends in the late Sixties considered Bowie’s Buddhist leanings to be hip affectations, others saw a more fervent side of him. The journalist George Tremlett and Bowie’s housemate/lover Mary Finnigan attested that Bowie was serious about Buddhism, speaking to them for hours about it. Whether he truly meant to join a Tibetan Buddhist monastery in Scotland, which he visited in late 1967, is very questionable.1 What’s not is that the symbols of Buddhism, its sutras, its concepts like reincarnation (see “Quicksand”), the Oversoul and astral projection (see “Did You Ever Have a Dream“), were essential to Bowie’s growth as a songwriter. Buddhism gave him a reservoir of imagery to use: it gave him a spiritual scaffolding. And the status of Tibet in 1966-7 made him, for one of the few times in his life, publicly political. After a decade of ‘tolerance,’ the Chinese government, now in the midst of the Cultural Revolution, was cracking down on Tibet. The 1959 uprising had been snuffed out by a vicious repression, in which possibly 80,000 Tibetans were killed, and the brutalities continued into the Sixties. The Dalai Lama went into exile, along with a number of other Buddhist lamas. Some of the latter made their way to London’s Buddhist Society, where they encountered an eager teenager from Bromley with a myriad questions for them (see “Karma Man,” his 1967 song about a Tibetan exile lost in the funfair of the West). Stories escaped of horrors: Tibetan monks tortured, sexually degraded, murdered; monasteries and holy places sacked and burned. A friend of Bowie’s at the time recalled him being “filled with anger” about Tibet, which began to appear in his art. His mime Jet-Sun and the Eagle, which he performed in 1968 and 1969, in part depicted a Chinese boy under the foot of Chinese Communists (it drew the indignation of a student Maoist, who reportedly heckled one performance), and his song “Wild-Eyed Boy from Freecloud” was a thinly-disguised rewrite of the scenario, in which a “wild boy” brings down the wrath of ancient Nature upon a village of dreadful occupiers. When you’re kind of young and idealist we were protesting the invasion of Tibet by China. And thirty years later they’re still there. Nothing has really moved. And more than anything else it was the lectures that the Dalai Lama has been doing over the last couple of years that really prodded me a bit. Made me feel quite guilty that I’ve known about this situation quite well and quite intimately for many, many years—that I hadn’t actually come out and made my stance on what I feel about it. So I guess that song in a way was to make some kind of amends. It had been a long time since Jet-Sun and the London Buddhist Society. It was the summer of 1996, in New York City, where Bowie was dashing out a new record. The lyric was a death mumble. A monk bleeds out in the snow, watches the sky fade, gets off a last prayer. Bowie’s voice in the verses was processed through a ring modulator, which gave it a crackly, papery sound, making it sound as if he was heard murmuring through an old radio. The landscape of the verse was filled with ‘past’ signifiers: Gabrels’ “Albatross” guitar; Mike Garson’s Farfisa organ; Bowie’s alto saxophone riff, meant to suggest “a Stax influence…the sort of sound you might imagine behind Al Green or Ann Peebles,” a line that’s eventually taken over by a second guitar. The rhythm was a set of loops that sounded like kettle drums and distorted tympani beats, and an agile foundation supplied by Dorsey, who had space and agility enough for quick, descending fills during turnarounds (for instance, at 1:18). The Free Tibet movement was a protest lodged against a country whose idea of handling dissent was crude, if efficient: black out the newscasts and send in the army, a situation that only worsened in the past decade. Today, China holds much of the West’s debt, has too great a grip on the world’s economy: the idea of it somehow being coerced into making Tibet independent seems akin to the United States agreeing to give back Florida to the surviving Seminoles. Worse, “Free Tibet” became a cliche, the favorite political cause of the affluent white hipster (Tibet was entry #124 in Christian Lander’s Stuff White People Like), a cause that required nothing from its advocates but a pleasant afternoon spent watching alternative bands, and a few bucks to buy rugs and amulets. Still, this makes light of the blood on the ground, and denies the Tibetan cause its agency: the 2008 riots, the protests of the late Eighties happened despite any hipster affectations. And Bowie wasn’t just a revived dilettante. After cutting “Seven Years,” he became more involved, publicly and privately, in Tibetan causes, playing at benefits for New York’s Tibet House, speaking out in the press. And he recorded a version of “Seven Years” in Mandarin Chinese, hoping, perhaps, it could be heard in Lhasa somewhere. It was the last #1 song of British-controlled Hong Kong, topping the charts in June 1997 as the Union Jack was lowered and the red flag raised. 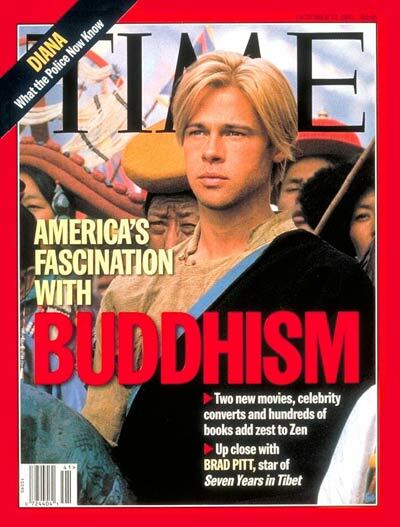 “Seven Years In Tibet,” as with much of Bowie’s Tibetan Buddhism, was an Eastern culture filtered through the eyes of the West: a lyric (and a sensibility) inspired by a book by an Austrian Nazi, later made into a movie starring Brad Pitt. Still, the core of Bowie’s last Tibetan song, the sequel of his youthful religious infatuation, kept true to Buddhism: that there is something eternal in us that can’t be destroyed, something that will outlast the depredations of conquerors and debasements of advertisers. It’s in Dorsey’s voice, suddenly heard in the final chorus, singing “nothing!” as a triumph, offering that Tibet, despite the world’s best efforts, is still free. Recorded August 1996, Looking Glass Studios, New York. An edited version of the track was issued as the fourth UK single from Earthling, in August 1997 (RCA/BMG 74321512542, UK #64), which included the Mandarin version and a live version of “Pallas Athena.” “Seven Years” was debuted at the Avalon, in Boston, on 13 September 1996. An acoustic version was taped at Smith’s Olde Bar, Atlanta, on 8 April 1997. 1 In yet another parallel, a fame-weary Scott Walker visited a monastery (a Christian one) around the same time. 2 “Albatross” inspired John Lennon and George Harrison for “Sun King” the following year. 3 It’s a fairly minimal chord structure, with the sharpening of minor chords driving harmonic momentum (Am-A#m-Gm in the intro and verses, for instance, or the Gm-G#m move at the end of the chorus) and a chorus that seems to be in a hidden F major (Gm-Am-Bb). 4 The film adaptation of Harrer’s book, with Pitt making a convincing Aryan, was released in October 1997, well after Earthling was recorded and released. So the fact that there was a “Seven Years in Tibet” song and movie released in the same year seems to be simply coincidence, though it’s possible Bowie knew they were filming the book when he wrote the lyric. 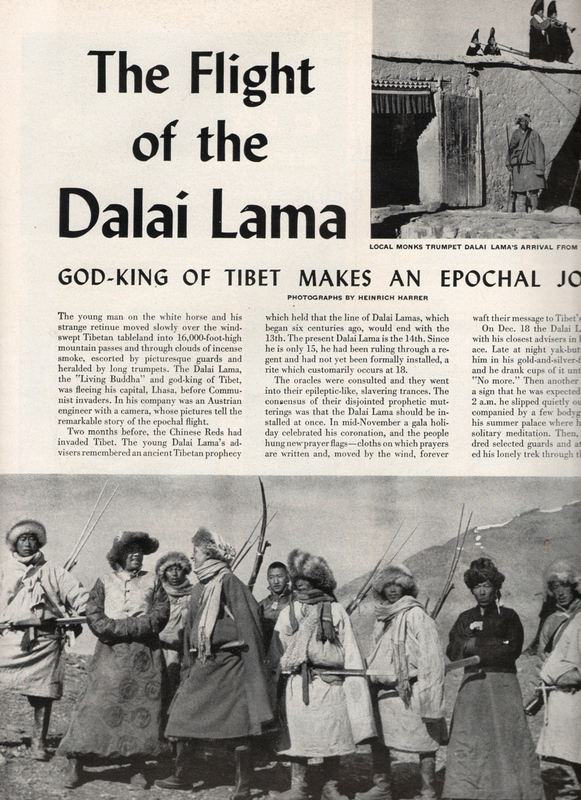 Top: The Saltmen of Tibet,(Koch, 1997); Harrer’s article on Tibet for Time, 1951.